thought mash: Syrian chemical weapons use, a fraudulent casus belli to justify western intervention? 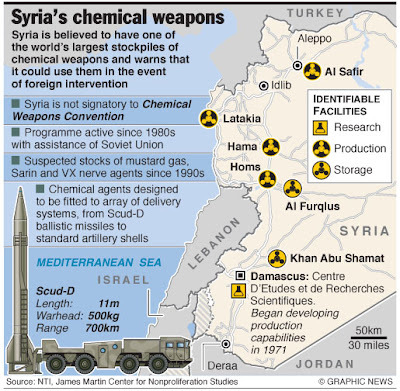 Syrian chemical weapons use, a fraudulent casus belli to justify western intervention? I find it highly unlikely that the Syrian regime which is desperately trying to hang on to control of the country, would use chemical weapons on a small scale against its people. This will increase the support that Europe and the United states are willing to give to the rebels and could lead to western intervention. It is a no-brainer, I find it even more amusing that the same WMD argument that was used as a casus belli for invading Iraq... will the public really buy the same spin that was used on them only 10 years beforehand? If Assad was going to gas people, he would go all out and severely weaken or destroy the Sunni insurgency (and would be killing a substantial number of people!). Anything less is just giving western powers a casus belli for invading, or at the least upping the support they are already giving Sunni insurgents. For once I have to agree with what the Syrian government has said in response to these allegations. Syria: U.S. manipulating chemical weapons evidence, like it did with Iraq"Everything that the American minister and British government have said lack credibility," Al-Zoubi said. "It's baseless, and it's a new tactic to put political and economic pressure on Syria." Al-Zoubi said the Syrian government is the one that called for an investigation of an incident in which it claimed chemical weapons were used by "terrorist groups." The government routinely labels rebel fighters as terrorists. Syria does not have chemical weapons and would not use them if it did, he said. The Americans "want to manipulate the issue, to let whoever used the chemical weapons ... get away (with it), and to repeat the Iraq example," Al-Zoubi said. Now if the USA wants to go into Syria, they will go in, and there are a number of geopolitical reasons why that could be beneficial. For one it will weaken Iran, which has an alliance with the Alawite led government. Secondly, it would weaken Russia, a supporter of the regime and the country has Russia's only remaining naval base in the Mediterranean sea. ‘West is using possibility of chemical weapons to encourage intervention in Syria’RT: The US says the data their intelligence has provided, is not irrefutable, meanwhile the Syrian opposition's demanding action from Washington, its allies and the UN. What was behind these unconfirmed statements then? LG: I think what’s happening is there are clearly conflicts about whether there should be direct intervention. There’s clearly many people in the opposition who want the US and western powers to intervene. There are politicians in all these countries who might want to, but who fear the consequences. Particularly in Britain, David Cameron knows that any sense that this is connected to the sort of thing that went on with Iraq is very unpopular so they’re nervous about it but at the same time they want regime change, they want to get rid of Assad, they want to be able to change the face of the Middle East so they fundamentally weaken Iran and its allies, which includes Syria, Hezbollah in Lebanon, and so on. However, the US could get bogged down in Syria, which is probably why it hasn't intervened already compared to the swift intervention against Libya. U.S.: No Good Options in a Syrian InterventionThe prospect of spillover violence notwithstanding, several other factors restrain U.S. intervention, including the cost of war and a lack of popular support. There is also the distinct possibility that once the al Assad regime falls, Syria could become a haven for transnational terrorists. Add to this the fact that intervention could go a long way in realizing a key American objective: undermining Iranian regional influence. Thus, Washington faces a dilemma: It cannot afford to participate in what may end up being an inevitable intervention.